We are manufacturer and exporter of a wide range of Air Cooled Heat Exchangers are constructed by Tubes & Fins so that the hot process fluid to be cooled flows through a tube while the cooling air flows across the outer surface to remove heat. 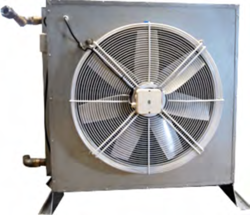 The cooling air is propelled by fans in either a forced draft or induced draft configuration. These Heat Exchangers can be Cover Plate / Plug Box and pipe bend models. We, at PEW, manufacture and export Air Heat Exchanger both in steam and hot oil heated medium. Air heat exchangers have smooth finned tube in which more fins per inch can be integrated in the entire tube length so that combination of low friction air loses/high air velocity and maximum heat transfer per square feet of face area results in high heating or cooling capacity of heat exchanger in a given space. These heat exchangers are light in weight. Our developed air heat exchangers are easy to handle and saves fuel that results in reduction in number of tubes for given B.T.U., transfer per area. Another advantage of these heat exchangers is that these require less power to deliver the required C.F.M because of lower air resistance. These heat exchangers are usually used in rice mills, tea factories, chemical & pharmaceutical industries. Seamless tubes & CDW tubes. Hot dip galvanized finned tube for better efficiency & to avoid rusting. Quality production with proper design. Looking for Air Cooled Heat Exchangers ?